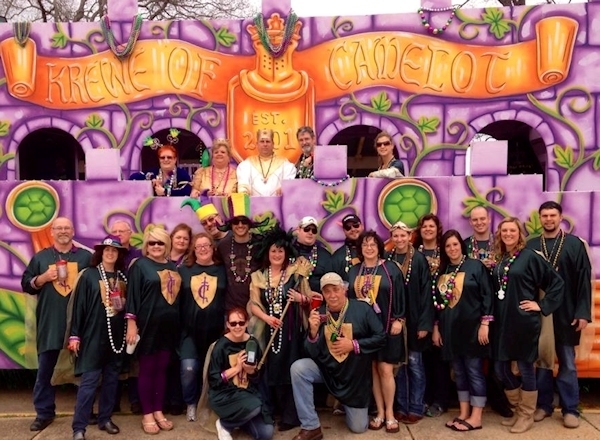 The Krewe of Camelot was formed in April 2000. The founders are Peggy Brunson, Jim Ducote, Pete Ferrington, along with, Eula Tarver, Leon Coody, Claude Mitchell, Stephen Gremillion, and Elaine Atwell as Charter Members. The Krewe’s membership is a combination of both men and women. Each year male members are selected to serve as KingArthur and his Knights of the Round Table and female members are selected to serve as Queen Guinevere and her Ladies of the Court. Members of Camelot enjoy getting together for various parties and events throughout the year. Each year a different Captain is selected to coordinate with the Board the festivities of Camelot. The Arthurian Legend speaks of an English town called Camelot, where King Arthur was said to have lived and was raised by Merlin the Magician. He was raised to reign, to be King in this land called Camelot. King Arthur and his court of knights would meet at what they called, “The Round Table”, to celebrate and discuss the goings on in Camelot. King Arthur and Queen Guinevere reined over Camelot. Camelot was not only their Kingdom, Camelot was their home. Camelot is characterized as a time and place that had high ideals. It was a place of excitement, of purpose and culture. In this land, peace reigned and love prevailed. In Camelot all was well and wonderful, life was grand and good. Camelot is a place where people would come together to celebrate their prosperity of wisdom, wealth, health and happiness. Camelot is the land of magic and wonder, of mystery and mysticism, of magicians and wizards, of seers and sorcerers, of love and bounty. It is where the veils of limitation are lifted. Camelot is a feeling place, a place of feeling gloriously good, and having good feelings towards all who dwell there. Camelot is where you take your worries and replace them with wonder. Camelot means looking forward with anticipation and excitement with what is sure to come, no matter what has become. If you thought Camelot was out of reach, or only a figment of your imagination, you have not touched your heart’s home touchstone. Here you awaken to your abundant successes, the birthright of all heirs to the family of Royalty. Camelot is where you bring all YOUR hearts desires home for the having. Camelot is home, and home is where the heart is.